I'm now trying to bring more social networking to North Winds starting off with a live Twitter feed of my account @penguin359. I'm looking at other ways I can better integrate North Winds with the social world as it seems people are less inclined to visit personal static sites nowadays. I've just revitalized my North Winds WordPress blog. I'm starting a new series on making system administration easy. Take a look and if you have any suggestions for posts I should do, leave a comment. My PhotoCatalog Android app has just been released. This app is designed to replace the functionality of InstaMapper as well as add an easier way to send photo and status updates back. It's not yet on the Android Market, but I plan to release it once the server side is more complete. You can download the current Apk on Google Code. 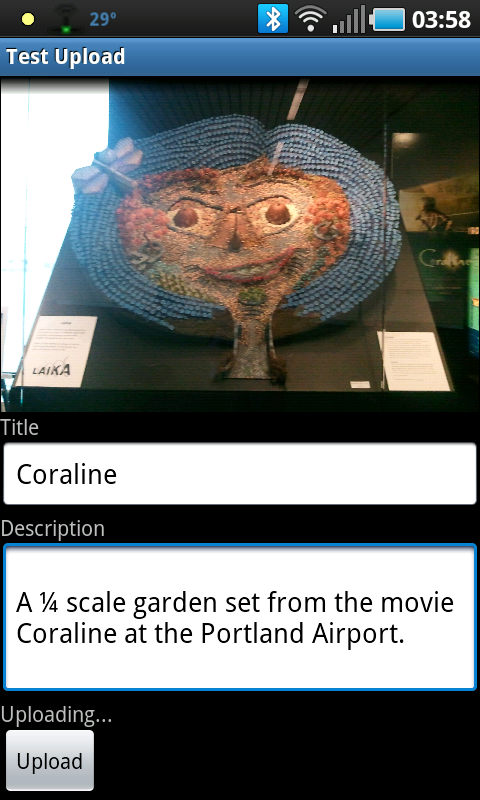 Lately, I've been working on developing an Android app to supplement PhotoCatalog support for Android. This app is designed to replace the functionality of InstaMapper as well as add an easier way to send photo and status updates back. I am close to releasing this app, but currently it's only available as source. I'm now back from a 10 day vacation to Viginia Beach, VA and Orlando, FL. The best part was I was able to capture the whole trip using my Photo Catalogging and Life Logging software. The trip can be seen at Disney Trip. This is just a small example of what it can do. It currently supports Facebook, FourSquare, and Twitter integration as well as supporting several GPS logging programs. Soon to come will be Flickr and Google Latitude support. Well, I haven't been doing much about a website revival, but I am doing a certain amount of work behind the scenes. My current project is some Photo Catalogging and Life Logging software. Check it out! I think it's about time for a website revival. I plan to start updating this website again and repairing all the cracks. Check back soon for updates. I have decided on using Wordpress instead. The blog is currently live. Ahh, I love it in Miami this time of year. It felt like a summer in Oregon. I was there on a business trip for Market America, but it was just as good as a vacation. Also, I now have photos up from my trip to LinuxWorld in 2004, and I finished a virtual tour of Ben's house which is where I am living currently. I am still looking for a good blogging program, but I am leaning towards BLOG:CMS right now. I have a temporary blog setup to play with using BLOG:CMS. Also, I've started working on a few styles for my logo. What you you think of this one? I now have some time to work on my website again. I have some New Years Eve photos up now and I've reworked the photo gallery to better fit in with the style of the rest of my site. The best part is now my site menu is available on every page of the photo gallery. Also I spent some time to make each directory show up as a thumbnail from within that directory which should make browsing easier. I also plan to setup a regular blog on my site, but I haven't decided what to use for it. I have a poll for some common blogging software packages or you can e-mail me any suggestions you have. Well, I finally have the first revision of my photos from my Europe Trip after about two months since I got back. I still need to sort through a lot of them, and give most of them names, but something is finally visible now. Well, it's been taking longer than I thought to sort through all my photos. Hopefully I'll be finished with my Europe Trips photos soon and get them up. I did finally get Rob's Bachelor Party photos up as well as a few Wedding photos. Also, I've been playing around with a new program that lets me upload photos to the web straight from my cellphone camera. I'm not sure if I'll really do much with it yet, but it might be interesting for taking some candids or some last-minute shots. Now that I'm back from Europe, I'll hopefully have some time to try and get some interesting content on this site as well as nearly 750 photos from my trip. The Streaming Audio's back up as I've had a few requests for it. Though, I need to setup better music playlists for it. Any requests? I'm leaving for Europe tomorrow so parts of North Winds will be down including the Streaming Audio until my return. Server's up again and everything should be working again. I've added a country music stream to the streaming audio server. I've also recently got a new digital camera so the newest pictures appearing on my photo gallery will be of a lot better quality. Some of the new galleries up are Firehouse Youth, Worship Night, and Cosmic Bowling. Grr, a second hard drive has failed, audio server down again and site maintainence delayed. North Winds isn't faring so well. I think I need to improving the cooling in my server. On the plus side, I've got some work done on my photo gallery. A few things have been rearranged and Janelle's Party photos are up. I now have all my original streams up plus a new worship music stream consisting of 5 different worship cds. Some new photos are up from the corn maze a couple sundays ago. Also, I have started work on a new logo and style for the website. Once I'm finished, I upload it all. The new hard drive has arrived and I've started rebuilding the data I've lossed. Hopefully, everything will be back to normal in this next week and I'll be able to get a logo finished for North Winds. Initial version of the North Winds website is up. The Photo Gallery and Streaming audio server are up, but not much else at the moment. I do plan on getting some more content on soon.